Jet Set Smart: WARDROBE WEDNESDAY: BIRTHDAYS ARE MORE FUN IN SEQUINS! WARDROBE WEDNESDAY: BIRTHDAYS ARE MORE FUN IN SEQUINS! A little over a week ago I turned 35! Yes, I'm in my mid-thirties! Should I scream? Should I be scared? Some say 35 is the new 25...right?!? More like, yeah right!!! Haha! Seriously, I don't know if I agree with that or if I even want that. I'm happy to be 35 and a mom of two sweet little boys...at 35 I feel alive! 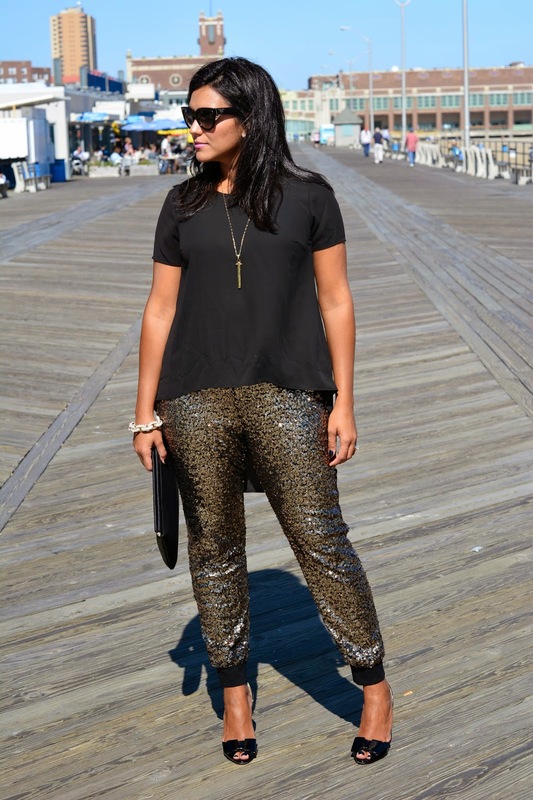 And that's why I decided to wear sequin pants for my birthday (see below)...because birthdays are more fun in sequins! Am I right? It was a great birthday, my parents got me my all time favorite cake from Ferrara's Bakery in Little Italy (Italian Wedding cake with vanilla and chocolate custard, a hint of rum, and almonds on the outside). I look forward to it every year...it is AMAZING!!!!!!!! Rich also took me out to dinner at Whispers Restaurant in Spring Lake. It's a BYOB, so we got to bring a nice bottle of wine our good friends gave us. It was such a fun date night! Oh, and how could I forget? No birthday would be complete without a little shopping right? Well, on our way to dinner, I made Rich drive me to one of my favorite stores (Marshalls), just so I could get a few birthday goodies (a.k.a #fabfound)...yes, I ran in wearing my sequin pants while Rich waited in the car. The life of a shopaholic!